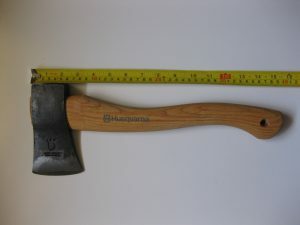 Husqvarna made a huge impact on the axe and hatchet market when it introduced their product line of hatchets and axes. 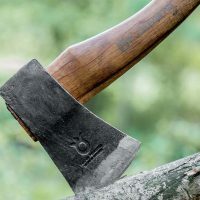 Their hatchets and axes have become very popular for lots of different users, from gardeners to campers to survivalists. In the following article I’ll go over why they have become so popular. 2 Who makes the hatchet? 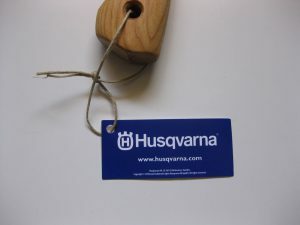 Husqvarna does not manufacture their own hatchets and it contracts out with several Swedish hatchet makers. 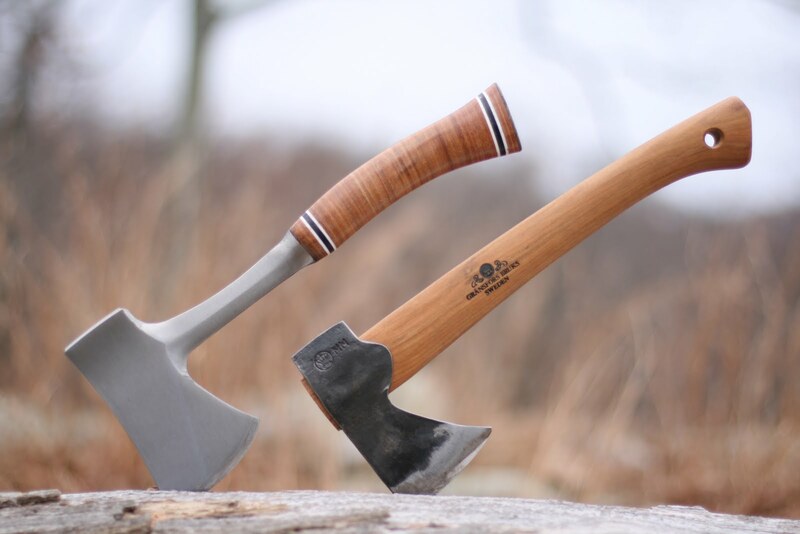 In 2011, it began to change their hatchet makers from Wetterlings to Hults Bruk. 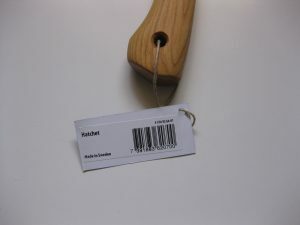 This caused several changes in the hatchets that were being made. This product isn’t to be confused with the Husqvarna axe. Axe’s have a much longer handle. 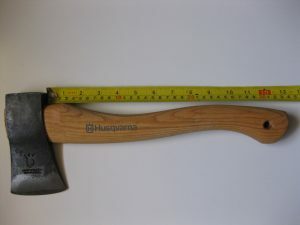 I have used a lot of hatchets in my day, and when it comes to using one that will last, I always pick the Husqvarna Hatchet. 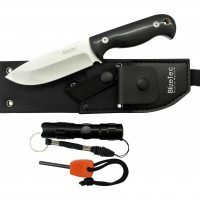 There are plenty of models that are out there, but none of them can really do the job that this one can when I go camping or backpacking. It allows me to be able to not only cut some firewood, but I can use it to whittle, make shelters, cooking rigs, and I have used it a few times to skin animals. 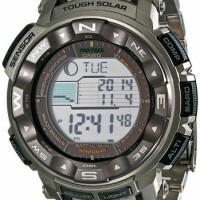 This model is literally a power house tool and comes at a bargain price considering the value (latest price here). The size is 15 inches. 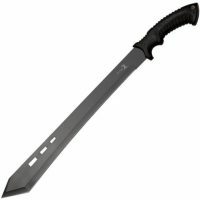 On the amazon description it says it’s 13 inches but that’s incorrect. The older model was 13 inches. The full size of the hatchet is 15 inches, the handle without the axe head is 13 inches as shown below. Head size is just over 6 inches. I have been using this Husqvarna hatchet for over two years now and I decided that we knew each other enough to do an in depth review. When I first got it and was doing some practice “air swings” around my living room, I believed that it was too heavy and was disappointed. Then I went outside and tested it out and I began to get used to it and I fell in love with it. It was during this time that I was using other hatchets that I believed were better, but boy was I wrong. I always seemed to come back to the Husqvarna Hatchet. I could not even believe that I thought it was too heavy or too wide to choke down on. Because I was used to light hatchets, it just took a little while to get used to the heavier hatchet. I believe that I just got stronger from using this hatchet and all of the drawbacks that I thought I had about this hatchet turned into huge advantages. I was able to focus on what I was doing instead of whining about how heavy it was. 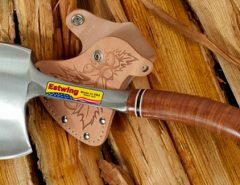 Yes, it may be easier to swing a lighter hatchet BUT to get the same amount of cutting power you have to swing much harder. The harder you swing, the more likely you are to make a mistake and hurt yourself. With the Husqvarna hatchet, you don’t have to swing anywhere near as hard to achieve greater cutting power. The weight is only an issue on the backswing, on the downswing you’re just letting gravity do it’s thing. You would think that you’d end up much more tired after using a heavy hatchet than a light one, but it doesn’t work out like that. 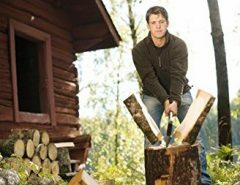 Because it’s only heavy on the backswing and you don’t have to swing as hard on the downswing and you get through the work faster you don’t end up any more tired using the Husqvarna hatchet. It’s also easier to hit the spot that you were aiming for when you don’t have to swing the hatchet too hard. 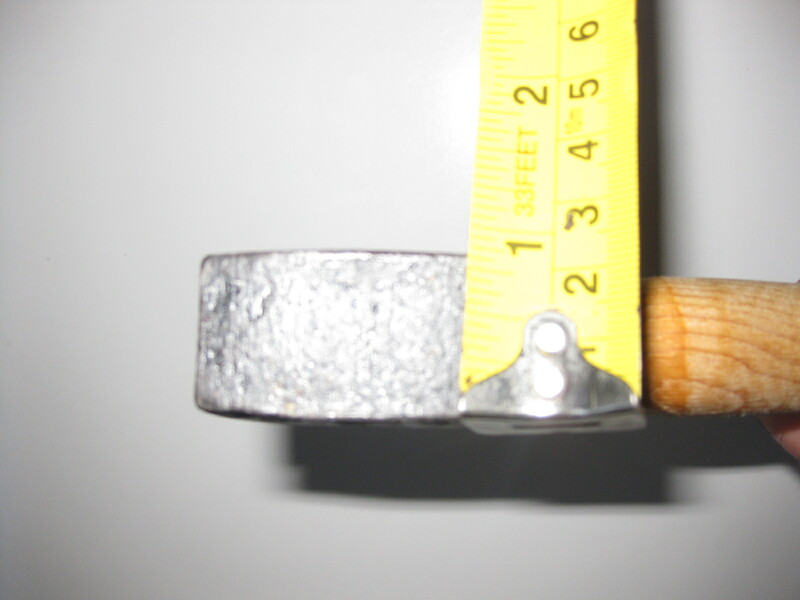 The wide shaft just makes sure that you are getting a firmer grip and even prevents the hatchet from turning in your hand. 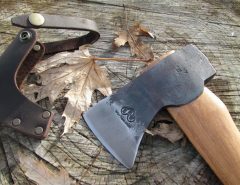 The axe head is made of Swedish steel and the handle is a very smooth hickory. I was amazed that I spent less than $50 on this great tool, and I am still amazed at how sharp it stays. 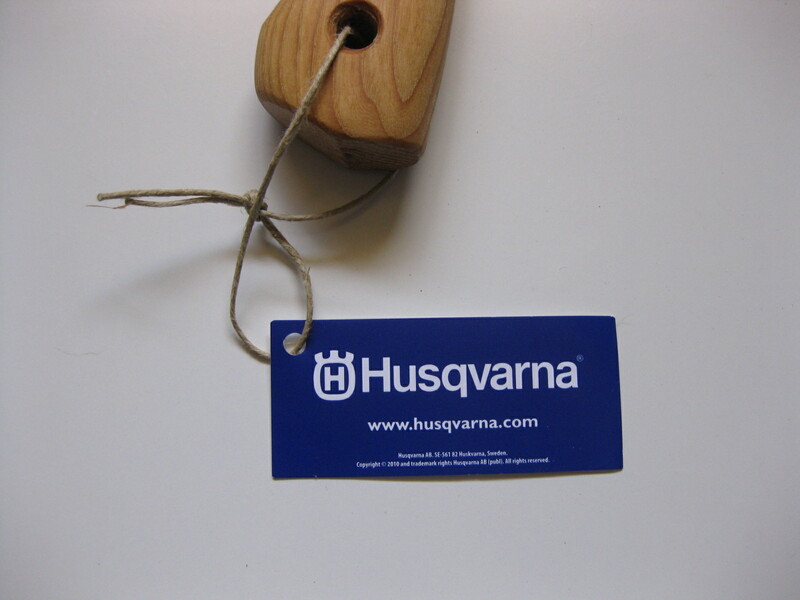 I use my Husqvarna a lot and it is great knowing that it is very durable. The handle is slightly thicker than normal, but that is okay for me, seeing how I want to know that I have a decent grip on it. The head design is great considering that the grinded part of the axe near the edge wasn’t at all polished and you can still see the grind marks on it. The best part is that the head is attached very well using a circular metal pin. The edge comes sharp enough to partially pass the paper test. I can get a couple of inches through, but not the whole sheet. That’s as sharp as you need your hatchet anyway. 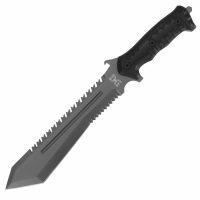 It keeps a great edge even after giving it a thorough work out. I love the fact that it’s hand forged, I love the fact that it’s made in Sweden, I love the length and weight but the number one reason I love this hatchet is Chopping power. 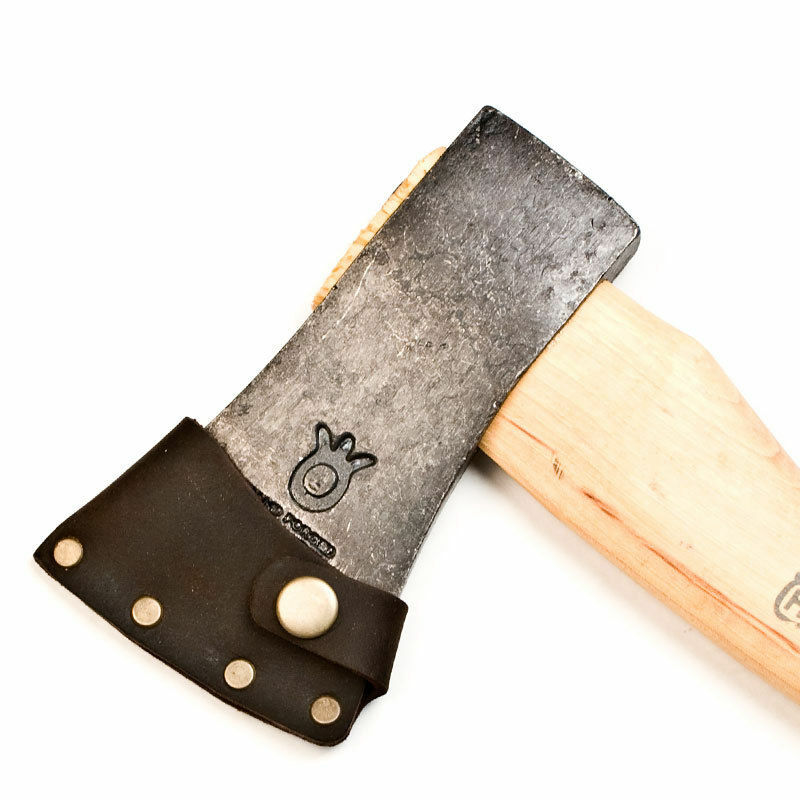 Pure and simple, it’s a beast and easily outperforms other mid-priced hatchets. Nothing comes close performance wise for mid-priced hatchets. 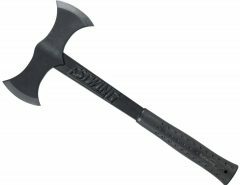 Because it’s got so much chopping power, it’s heaps of fun to use because you feel like Arnold Schwarzenegger because you’re cutting in much deeper than you would with other hatchets. 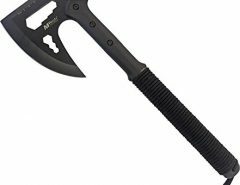 It runs around $40-$50 (check the amazon price – here), which makes it a mid-range hatchet when it comes to how much it costs. The reason you’re not paying $100 more for this hatchet is because the finishing of it isn’t perfect. There are still grind marks on the axe edge, it’s not a “mirror” finish. Does it affect the performance? No. I’d much rather save $100 and have an awesome tool than spend another $100 on something that’s used to chop wood. It’s not a beauty contest, it’s a chopping contest. 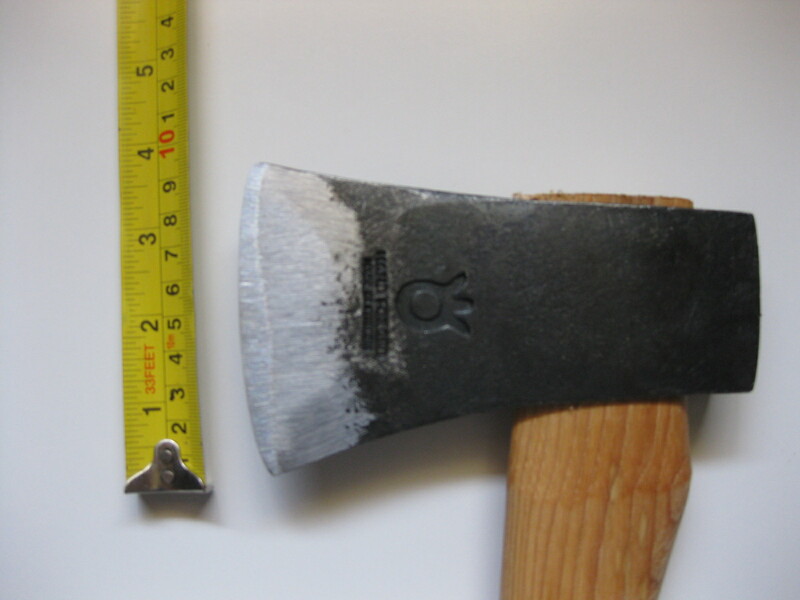 It should be noted that the old Husqvarna hatchets used to be made by Wetterlings, which was not of good quality and you can tell by the strike patterns on the hatchet. The handle of the Husqvarna hatchet has a good grain when compared to the previous models. It is larger as well. It is two inches longer than the older model and it is a bit thicker as well. The handle is still comfortable to use, but the size difference is very noticeable. The difference in handle size accounts for the weight difference as well. 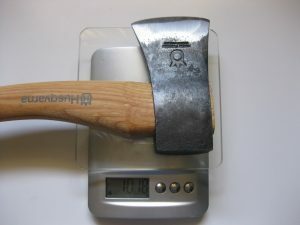 The head weight is about the same, the extra length and thickness of the handle makes it a bit of a heavier hatchet, coming in at 2.2 pounds. The head design is great. The overall geometry and shape is excellent. This design has been used by Hults Bruk (a premium axe manufacturer) for a very long time as their main pattern. 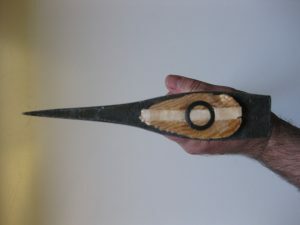 The axe edge is big, the cheeks have a great curvature and the head is very well balanced. The hatchet came very sharp. I have heard some complaints about this hatchet that the grind of the bit didn’t seem to be polished at all, and that you were able to see grind marks. 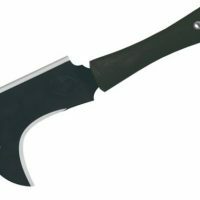 Even though this is true, it does not effect the performance of the hatchet. 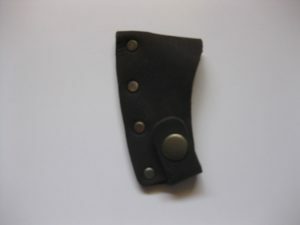 To keep the blade protected it came with a leather sheath. If you want to you can just puncture holes in to the sheath on the sides to put a leather band through to help it to stay on the hatchet but I’ve had no issues with the sheath falling off. There used to be an issue with the sheaths falling off, but that was the older model. It’s all fixed now. Let’s talk about the pro’s and con’s. 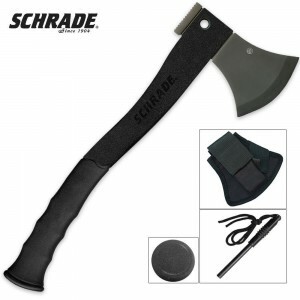 A great hatchet is a must for your survival backpack. 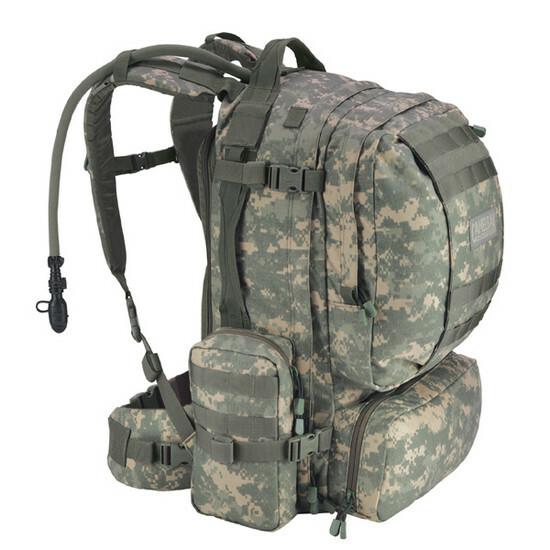 Overall, it’s a great buy when you plan to be out backpacking or camping. 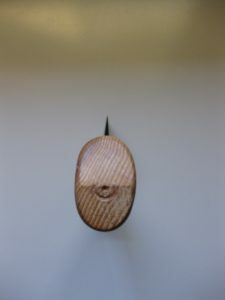 It is even good if you plan to use it around your home for random projects. It is completely versatile. I wasn’t expecting a huge difference from other models, but it is small enough to carry around, and still handles the biggest jobs. 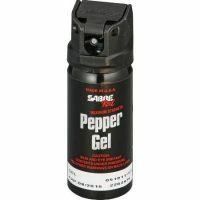 You can certainly use it in any situation. 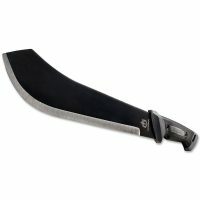 I highly recommend the Husqvarna hatchet. It can be purchased at a great price here. 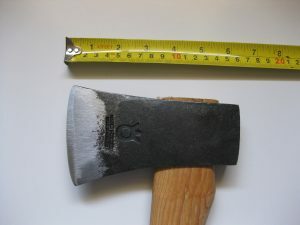 This is a hatchet that will have its little imperfections, just like the older models. They are normally minor and can be fixed if you really want to but the imperfections don’t affect the performance. 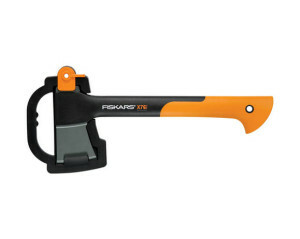 If we are wanting a great practical tool, then you need the Husqvarna Hatchet. 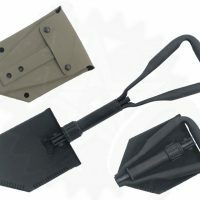 If you’re looking for a backup to your hatchet, try my Survival tools page. 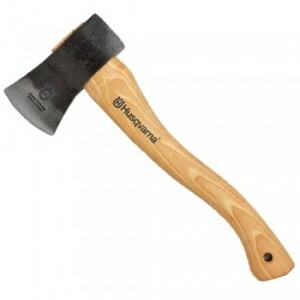 We’ve got a page which compares the best hatchet’s on the market.